Not too many people at the session tonight. A little more than a handful. But they still got off. One time each. A few of my favorites were there — Creez and Worm. I don’t think it was my first time seeing Unknown, but now I know his name, and I like him too. 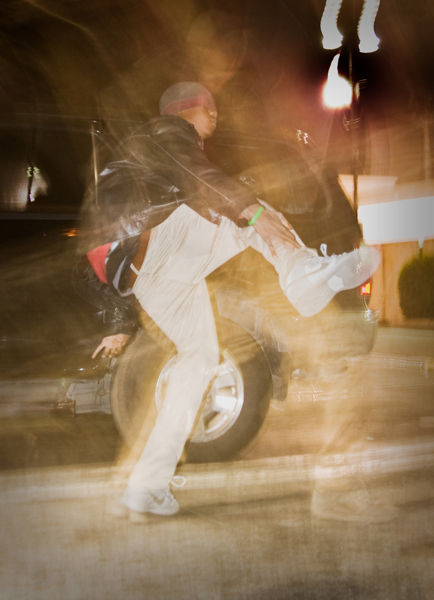 When I asked Creez about dancing in the parking lot, he told me, “Krump came from the streets. We are street cats from the hood — South Central, Inglewood, Watts, Compton.” We could be anywhere, he told me. “But we’re out here doing something positive. 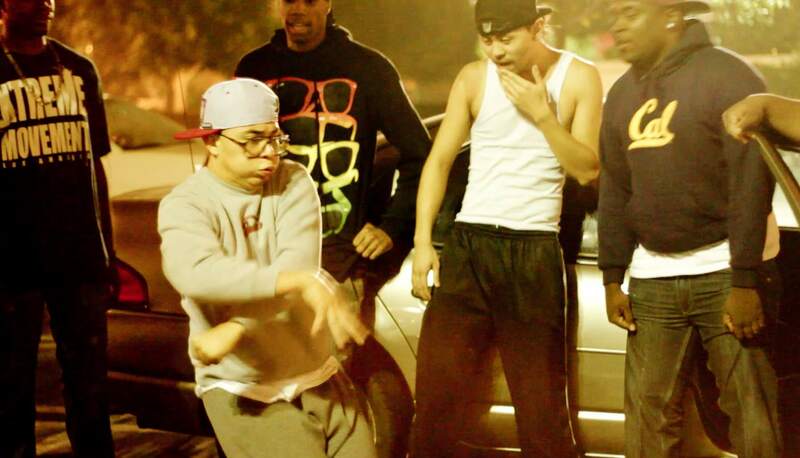 Krump versus everything,” he declared. Unknown, aka Chris, emphasized that krump originated in a rough neighborhood, and now here they are performing in a safe environment. He seemed proud of that fact. Around 2:15 a.m. a police car rolls up flashing its siren. The North Hollywood Ralphs parking lot is empty. 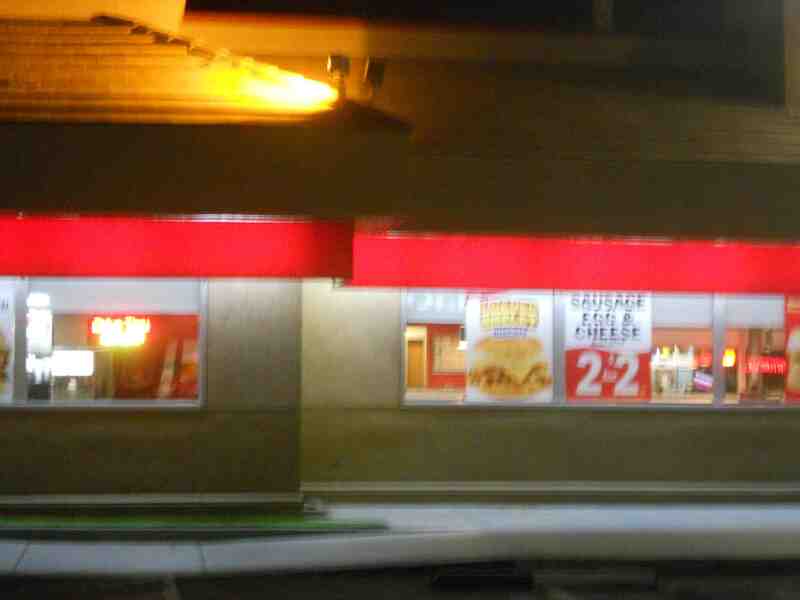 Except for a few fast-food stops, the shops are closed. About a dozen silhouettes are gathered under a bright lamp in a circle. A parked car blasts hip-hop music. Some of the spectators nod their heads to the beat, chest popping and foot stomping, waiting for a turn in the center. The police car slowly approaches, then stops. It beams a spotlight in the group’s direction. Catching sight of the cops, a young man pushes the circle open into a half moon, giving them an unobstructed view. “Let them see we’re just dancing,” he says. As the people part, a lone male krumper jumps into view. Ignoring the cops, the dancer throws his arms to the sky, hops on one knee and bounces to his feet. “Show them how you roll, Lil’ C,” someone from the circle yells. If they recognize the soloist, the cops don’t make it obvious. Lil’ C was one of the stars of Dave LaChapelle’s 2005 documentary Rize, and is seen on TV as a guest judge on FOX’s “So You Think You Can Dance.” Just following orders, the cops are determined to shut down the 818 Session, named after its area code. An officer shouts to the crowd through his megaphone that he has received noise complaints. Lil’ C still doesn’t stop. He hits his elbow with his knee, swings both arms alternately through his legs, tilts forward and steps back. Eventually, he plants his last foot stomp and walks off into the already dispersing crowd. The 818 Session takes place every Wednesday around midnight in the massive parking lot on the corner of Magnolia Boulevard and Vineland Avenue in North Hollywood. It has become a ritual for the dancers that show up each week. 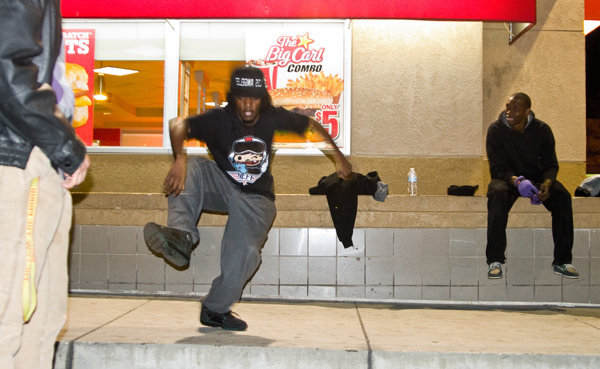 It’s neutral ground, a safe space far from krump dancing’s birthplace in South Los Angeles. Many of the dancers travel from far away to get here. 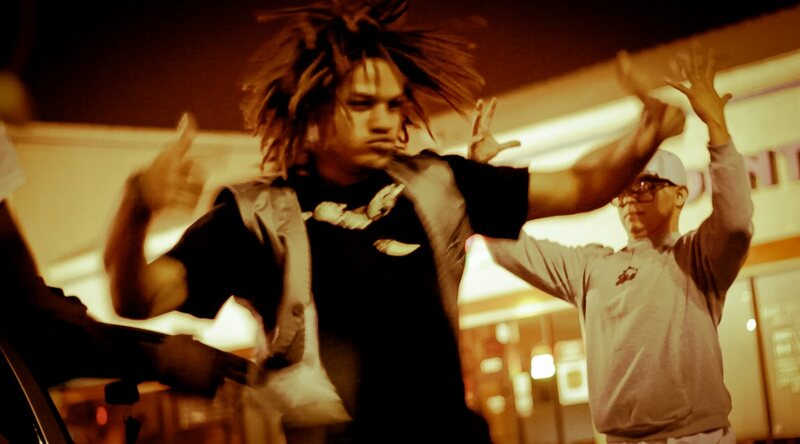 Others, many of the founders of krump, have permanently relocated to North Hollywood from South L.A.
Before Occupy Wall Street set up in Zuccotti Park, these krump dancers were taking over the Ralphs parking lot to assert their humanity. The 818 Session reimagines the use of this public space, which was created to facilitate capital and commerce, and transforms it into an opportunity for creative expression, emotional release and community building. The dancers, for a variety of reasons, including lack of money and available free community space, do not have a more formal meeting place. This weekly performance ritual allows this dance community to gather and express themselves on open, safe ground. Public space is scarce, and more of it is being privatized each day, which means more of it exists for the haves and less can be used for community interaction and play. 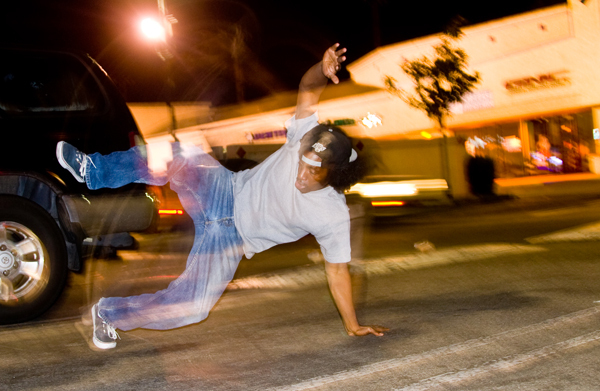 Krump and the space in which it is performed facilitate cross-cultural exposure, understanding and the sharing of ideas, and ultimately, has helped grow a South L.A. street dance style into a global phenomenon. Celebrating its 10th anniversary, krump has spilled into public spaces, reaffirming the needs of a multicultural city’s residents to express, bond and interact in safe public space, which is rapidly disappearing. When I was filming my mini-doc about the 818 Session, I shot footage of the Ralphs parking lot in North Hollywood during the day. I never thought that this would be an interesting juxtaposition of images (day versus night) until Matthew Lahey at the Annenberg Lab commented to me how fascinating it was to him when places (often public) are used for unconventional purposes — and not too many people know about it. Like krump dancing in a parking lot at midnight. Below is footage of what the lot looks like during an average day, the people that frequent the stores and the businesses when they’re open. This also better illustates how these dancers are reimagining public space designated for shopping — transforming space used for commerce into a temporary home for creative movement and expression.